Here is Ijaz Ahmed’s response to Jay Smith’s article that I reproduced above. It is an excellent deconstruction. Therefore, the imagined claims of a yet to be canonized scripture cannot be qualified given anyone’s actual reading of either of these narrations. It then must be asked of you and not of Dr. Ehrman, if you yourself actually know the traditional story of the Qur’an’s preservation. You mention that since these manuscripts date before the time of ‘Uthman’s alleged rescension, that this must mean they are corrupted. To the contrary, only manuscripts which were not authorized (read as modern “to be published”) were brought into conformity with the “rasm” (read as orthography) of the Prophetic tradition. The fact that the text of Mingana Arabica 1572a agrees with our modern text, clearly contradicts your assertion that it must be “examples of those very corrupted manuscripts” (a term, not found in either of the narrations you referenced). You then proceeded to copy paste Spencer’s woeful argument that the stories mentioned in Surah 18 must have been written later, therefore the dating must be wrong. In the real world, we do not conform our theories to evidences, rather we let the evidences work for, or against our theories. In this case, it is called “proof by contradiction”, in that both you and Spencer seem unable to grasp the reality that the manuscript has been properly dated and that its text is in conformity with the traditional story of preservation. This does not mean the datings are wrong, it means your timeline of perceived development of the text is wrong. In other words, the proof of the datings, contradicts your claims, ergo you’ve been proven to be wrong. Jay……, Jay………, Jay. I don’t know what to say, except that not only are you wrong, you’re very wrong and at this point you’re just embarrassing yourself. Take a look at this wonderful manuscript of the Qur’an, from the 1st century AH, written in Hijazi, that’s written on….papyrus! Given that you “professionally study the Qur’an”, it esacpes me how one of the only major news stories of 2014 concerning the Qur’an would slip by you. I think he means codices and not manuscripts, because if he means manuscripts, then yes we do have several folios of complete manuscripts of the Qur’an that pre-date 650 CE. What manuscripts would that be? Well it would be the four from Birmingham, that’s just one example off the top of my head that would be extremely relevant to the very topic at hand! Also, as pointed out in my paper to you, we do have 100% of the Qur’an from within the 1st century of hijrah. So, to the contrary, yes, a folio or two does add up when you end up with 100% of the text you were aiming to find. All he’s saying is that what was copied, would somewhat prove that it was copied correctly. I’m looking for where he does not say, “these pages of the Qur’an” and where he says “entire Qur’an”, and well, I can’t find it. Essentially, what Smith did, was open his mouth, make up something, argue against that made up statement and then cheer himself for winning an argument that he himself made. It’s just embarrassing and depressing. 3. 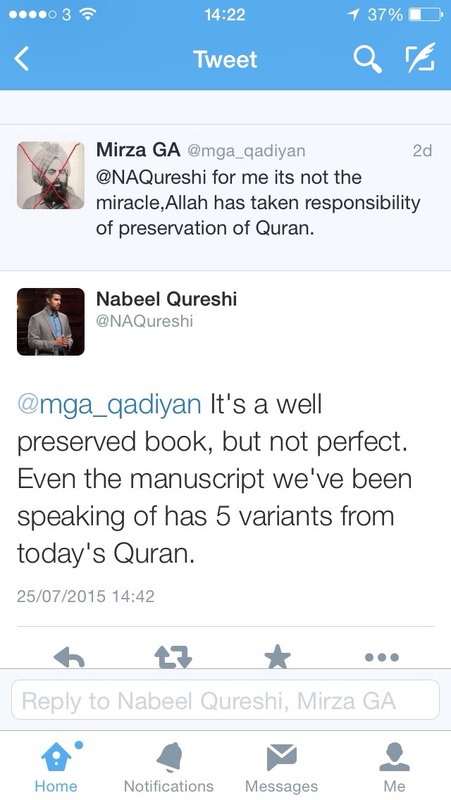 Smith claims that the 4 folios (pages) do contain variants when compared with the Qur’an of today. To the contrary, the manuscript contains 0 variants (orthography aside). What it does contain are two words that the scribe changed from the reading of Ibn Masud, and Isa b. Amr and Al-Thahak b. Muzahim on lines 13 and 30, to the reading of ‘Uthman. Therefore, the manuscript, in its state as left by the scribe does conform to the Qur’an of today. Even if the scribe had preferred the reading of one word (واشدد), it is from the Qira’at of the Prophet (ﷺ) through Ibn Masud, or if the scribe had preferred the reading of the other word (طاوى) through Isa b. Amr and Al-Thahak b. Muzahim, it is also from the Qira’at, both of which are from the Qur’an. Therefore, by all measurements, there are no variants except for the notable difference in use of the letter “alif” which is due to orthographic development. 4. Smith claims that BBC sensationalized the story by leaving out the mention that the original scribe chose to conform to the ‘Uthmani recitation in two words. Since this is an autographic text and the scribe chose to write the text according to the ‘Uthmani rasm, then it is not a variant, as it already agrees with the modern text. If the scribe had chosen to keep the two different words (one due to use of an ‘alif), it would still conform as it is from the Qira’at of the Prophet (ﷺ), which the textual critic Alba of Birmingham University also mentions. 5. Smith refers to intentional changes to conform to the published edition from his friend’s Dan’s thesis, which I tore apart as being unqualified in my paper here. Not only does Dan confuse the orthography of the Arabic language with “intentional” changes, he seemed unable to find the most basic variants that belonged to the Qira’at. Most of his paper focused on him being unable to find the variants in the Qira’at literature, yet somehow I was able to find several and without much time. 6. Smith refers to orthographic differences as “scribal errors”. I suggest he reads any book on language development or of textual criticism. Lapsus calami, or scribal errors, do not include orthographic development. If that were the case, almost all medieval NT manuscripts would then have to be considered erratic en toto because of the shift of majuscule scriptio continua to miniscule polytonic. In other words, not only is he wrong, he spent 20 years not understanding the basics of textual criticism, for someone the age of all his years of study to correct him on it (me). I suggest he Google’s the term manuscript. The very folios we are looking at right now from Birmingham do contain a manuscript (folio, leaf, page) that has no lacunae (Smith, this term means gaps or missing data), the recto and verso of Mingana Arabica 1572a which contains Surah 20, is complete. You’re free to see the scans yourself, which I am sure you are able to access, as I have been. You’re free to point out to me, which lines from 1 to 40 on the manuscript are incomplete. At that point, when you realise you were wrong, feel free to contact me and I’ll forgive you and pray for you. “Surprisingly, the lower script on occasion appears to use what are possibly diacritics, in the form of perfectly round dots, to signify short vowel marks (and possibly elided alifs, i.e. hamzat al-waṣl). These dots are in the same ink as the rest of the lower writing and do not appear to have been added later.” – Arabica 57 (2010), page 359. Why is this of significance? Well, because according to his latest datings, as linked to us by Goudarzi himself (Dr. Sadeghi’s research partner), Dr. Sadeghi dates Sana’aa C1 to the first half of the first century hijrah, the same as our Birmingham manuscripts. The same can also be found, in Qaf 47, which is also dated to the same time as our Birmingham manuscripts. In other words, Spencer is not a textual critic and as it stands, these non-Muslim textual critics seem to be in unanimous agreement about the early datings of several folios and their use of diacritical marks in the early hijazi script. Ergo, Spencer is wrong. As a closing point, I’ve dealt with Spencer and Smith’s ridiculous claims and for the fun of it, I’ve decided to include my favourite Qadiani-Trinitarian into the mix. Nabeel, you cannot count, nor can you read. I’m sorry if you feel insulted by this, but you posted something wrong in public and it is my job to correct you when you slip up. Which these days, seems to be quite often. The same goes to you as it did to Smith. There are no variants in the manuscript. None. Except, if we are to be pedantic, that there are changes the original scribe made, then at the very least we can stretch to say there are two “variants”. How 2 = 5, I do not know. Hopefully, once you solve the mystery of the Trinity, you can help me solve how 0 = 5 or, for the sake of argument, how 2 = 5. I’m afraid your logic does not follow with me, and I am pretty bad at math. ‹ An American missionary based in London criticises Professor Bart Ehrman on the Quran. Bet Ijaz was singing ‘clowns to the left of me, jokers to the right’ while writing this. Do you not feel Ijaz Ahmad just tortured Smith, Spencer and Nabeel as per Mr Blonde’s infamous scene in The Reservoir Dogs? How Trinitarians can accept this level of shoddy scholarship from their supposed apologists is beyond me. Sorry peeps, PLEASE INDULGE ME AGAIN..
Ijaz’s mission brief is to set up a team of hardy fellas to find some ‘NT’ papyri. I’m sure he’d be able to get a few volunteers with a varied set of skills that would be useful for this expedition; Shoebat and Kamal Saleem, those boys are good at digging tunnels and useful if anything needs to be blown up,that Anis Shorosh fella is skilled in burning things and the medical doctor Nabeel would be useful in case anybody gets injured in this daring mission while Wood and Ted Shoebat would be the enforcers just in case they encounter a bunch of half naked natives running around with spears, Jay Smith would be there as a clown to keep everybody entertained, James White would be useful to ride a rickshaw as he has a cycling background and Shamoun would be useful to supply the hot air so they can get a hot air balloon set up to escape with the scraps of papyri (whatever happened to hot air balloons, they don’t feature in movies any more!). It will be like a scene out of Indiana Jones. I hope Ijaz has an whip and a hat! You never know you may find something like the 1800s Von Tischendorf find which led them to downgrade the last few verses in a book they named ‘Gospel of Mark’ as a possible forgery. Muslims really should put a few quid into the kitty for this expedition, let’s try and establish a few more NT forgeries. If you live in the M.E please check your basements and have a dig of your garden. American Trinitarians are desperate for some early manuscripts of something called a ‘New Testament’. its what they do best! Yet on the Bible their standards are quite different. I have yet to met a consistent Christian apologist..
“I have yet to met a consistent Christian apologist.” They can be consistent and inconsistent both at the same time. One Person, two natures. The irony of all this is quite striking. Missionaries such as Smith and Spencer are willing to take their theories about the Qur’an as Gospel truth, but won’t dare apply such theories to the Gospels themselves. If they were consistent, they’d have apostated from Christianity by now.